Hair Extensions Forum • Rough, natural looking wool dreads? I'm going to start making my first set of wool dreads and I'm a total newbie. I have these beautiful merino wool bundles in shades of blue and purple. I've read the FAQ's and tons of other posts and I think I know what to do and such, but I haven't managed to find how to achieve a more natural looking dread? I want them to be a bit messy, not totally even and a bit rough with a skinny tapered end. Like real hair would look like, sort of. Except wool. And I don't really want synthetic dreads. How can I do that? Should I crochet and then felt? Back-comb first? Try to back-comb after them being felted? Braid and then felt? Dry-felt? Is it easier to get them to look like that in the washing machine or should I do it by hand? Is it even possible to get more textured wool dreads? Also I have a sidecut, and I've been thinking about making double ended dreadlocks, however I've started to wonder if I should do them single ended instead, because I think it'll be very obvious that they are braided in when you see the sides of the dread, and I want a quite natural look. What do you recommend? Ahh. Sorry for all the questions. I'll love you forever if you help me! And I adore these natural synthetic dreads from VisenSingsBlack and I kind of want something like this. Except not synthetic. Uhm. Re: Rough, natural looking wool dreads? Most of those pics are not roving, I'm afraid. The first is a mix of slub yarn, probably Colinette point 5, and skinny twisted synth dreads. 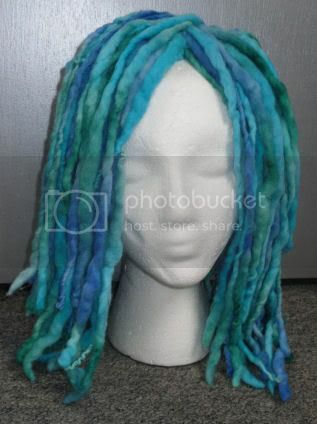 The blonde pic is real dreads and the blue also looks like slub yarn to me. Obviously, vixen's are synth hair. The reds are roving. That picture is many years old so the method used was probably the traditional wet felting and rolling technique. My advice is to experiment with different techniques first. Only use a little bit of your wool and see what comes up most true to your idea. There will be plenty of advice for you on how to improve or correct your results if you need it but the best thing is to get stuck in with the techniques you know about and see what you get. You might be a roving queen and have a natural untapped talent; you won't know until you try. Good luck and have fun. Honestly, SE's nearly killed me & I vowed to never, ever make them again. Aside from that...I echo what Gracey has already said. And I echo them both! You'll want DE's, and you'll want to do a blanket-stich for minimum braid visibility. SE's can be tricky to make. Roving is really fun though, and forgiving once you understand the medium and how it works. Try something different and see if you come up with something amazing to share with everyone else! I thought the blonde dreads were real at first, but I did do a double take and I'm not positive. ..::AtomicLox::.. wrote: I thought the blonde dreads were real at first, but I did do a double take and I'm not positive. I'm positive. They have a bit of skinny-root-fat-end going on and some flyaways, and the crochet work is visible further down the dread. They are very pretty though. They're made using my washing machine technique. I've made natural looking ones before as has quietsleeper. I'll link mine when I get home and on my laptop. DreadstarMonstar wrote: They're made using my washing machine technique. I've made natural looking ones before as has quietsleeper. I'll link mine when I get home and on my laptop. Oh, I've been drooling over yours before. They are wonderful. Do you think it's possible to do them with a skinny end though? I love that they are a bit crinkly. have anyone of you ever done crocheted wool dreads? maybe I'm really bad at google searching but I haven't managed to find some good examples. Yeah, most of mine have skinny tapered ends. Check the album link. Miasma has made crochet versions, there's a show off on here somewhere. Search for her and check her posts, I think the title includes something about not believing its butter if memory serves. thank you! that's exactly what I have in mind. I'll play around a bit I think. Hey! Okay, so I reckon SEs are just as easy to do as DEs, check out my budget tutorial here http://hairextensionsforum.com/viewtopi ... 65&t=11793 (there's a bit at the start that links to another tutorial of mine if you don't have a spinning wheel). It's not really crocheted like the synth ladies do it, but it's as close as I can get so far, as you can't really crochet it properly seeing as the individual fibres are so much shorter. But easier, and pretty much as good in my opinion, is just twisting it up and putting it through a hot wash. Do experiment with a few first (but be aware that each wash seems to be different and different things happen when there's more dreads in your pillowcase or whatever) and it works best when you twist it up really tight and then cook it. IT gets kind of hairy and pleasingly random. Oh, and I know you already have wool, but the best wool for felting is Corriedale. I've only ever used Merino by mistake and I couldn't get it to felt. I did say unless she is a s much of a roving goddess as you Cathy! I can't do SE's I don't like them. Maybe it's my methos of making them IDK. Weird. I only ever use merino from one certain seller as I know it works every time without too much shrinkage or lack of felting. I've tried corridale & the stuff in the UK is a lot rougher than the corridale you use Cathy. yes harriet's dreads were real, she no longer has them, they were lush! I was gonna say, mine really are kind of rough, but then I remembered I actually did some for you so you'd know! You can get the same stuff I use in the UK, the distributor is at www.ashforduk.co.uk and you can tell cause it's got the same colour names. Aaaand, um, I was going to say something else but I've forgotten. Huh huh.